According to the Centers for Disease Control and Prevention (CDC), there is currently no vaccine to prevent the disease or any drugs to treat it. The best way to prevent Zika and other mosquito-borne diseases, including West Nile virus, is to protect yourself and your family from mosquito bites. Aedes mosquitoes are considered day biters, so it's important to limit exposure to mosquitoes, which may include clothing and use of mosquito repellents. See the box for tips on how to avoid mosquito bites. Consumer Reports, a nonprofit educational and consumer product research group, recently tested 16 mosquito repellent products containing a variety of ingredients to find out which were the most effective. Products tested included those with the active ingredients DEET, picaridin, oil of lemon eucalyptus (also known as PMD or para-menthane-diol), as well as a variety of plant oils, such as cedar, citronella, geraniol, lemongrass, and rosemary. See Table 1. 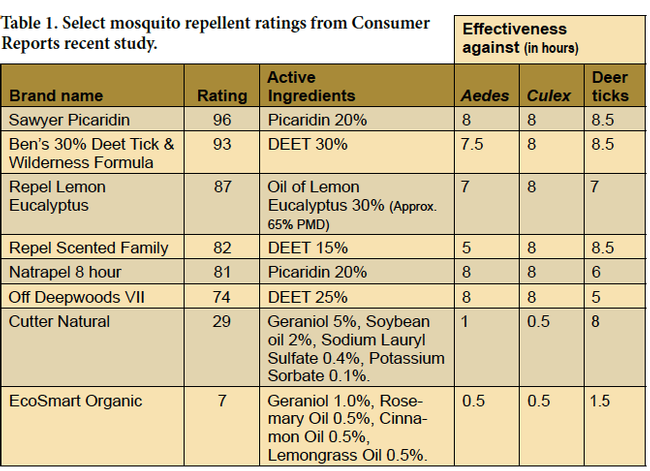 Select mosquito ratings from Consumer Reports study. The most effective products against Aedes mosquitoes were those containing 20% picaridin and 25% DEET. 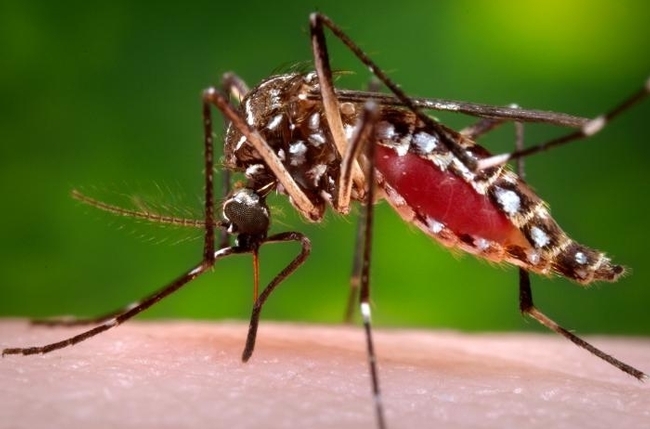 These concentrations of active ingredients kept mosquitoes from biting for about 8 hours. Furthermore, one product (Sawyer Fisherman's Formula Picaridin) was reportedly the only one among those tested that also kept Culex mosquitoes (which can spread West Nile virus), as well as deer ticks away for at least 8 hours. DEET is the most effective mosquito repellent if you will be out for long periods where mosquitoes are abundant. However, DEET is an irritant to some people, and repellents containing high DEET concentrations can damage synthetic materials such as clothing or plastics. Consumer Reports suggests avoiding products made with natural oils such as citronella, lemongrass oil, cedar oil, geraniol, rosemary oil, cinnamon oil, and others. According to their analyses, many of these products were only effective against Aedes mosquitoes for 1 hour or less. Click here to read the full article and find the ratings of all products tested. Stay in places with air conditioning and window / door screens. Empty, cover, or clean up any items outside of your home that can hold water. For specific tips, see the resources at the end of this article. If traveling overseas to areas where mosquito-borne diseases are common, sleep under a mosquito bed net. Use EPA-registered insect repellents with one of the following active ingredients: DEET, picaridin, IR3535, oil of lemon eucalyptus (PMD). o For children younger than 3 years old, do not use products containing oil of lemon eucalyptus or PMD. o Cover cribs, strollers, and baby carriers with mosquito netting. o Do not apply insect repellent onto a child's hands, eyes, mouth, or cut or irritated skin. o Adults: Spray insect repellent onto your hands and then apply to a child's face. CDC recommends using products containing active ingredients registered by the U.S. Environmental Protection Agency (EPA) for use as repellents applied to skin and clothing. An EPA registration indicates the active ingredients of repellents have been tested for human safety when applied according to the instructions on the label. When used as directed, EPA-registered insect repellents are proven safe and effective, even for pregnant and breast-feeding women. To see if a mosquito repellent is registered by the EPA, look for its registration number on the package, which usually is written as "EPA Reg." or check the EPA Web site. Learn more about the Zika virus and find information on prevention, symptoms, and risks on the CDC Web site and on the American Mosquito Control Association Web site. For general information about managing mosquitoes, reducing breeding habitats, and using insect repellent, see the UC IPM Pest Notes: Mosquitoes. Always read and carefully follow all precautions and safety instructions provided on the pesticide container label, as well as any other regulations regarding the use of pesticides. Not following label directions, even if they conflict with information provided herein, is a violation of state and federal law. No endorsements of named products are intended, nor is criticism implied of products not mentioned.